A boutique hotel designed for two! Opening its magnificent doors in June 2017, the adults only, Sa Creu Nova Art Hotel & Spa, is a labour of love. It is a dream come true for Catalan couple Teresa Artés de Arcos and her creative husband Enrique Picó who is largely credited with bringing his design skills to bear for many of the fixtures and fittings, as well as the interior and exterior decoration. I heard about this project long before I had the opportunity to visit, and considering that it only took a year and a half to construct, the result is outstanding. Three separate town houses became one to make-up the new, stylish urban boutique hotel. There are many villages and towns much more attractive on Mallorca than Campos, but the surrounding area is well-worth getting to know. Like me, you are quite likely to fall in love with the unspoiled beauty of Es Trenc beach (14 Km away), and the authentic town or cute cala of Santanyi, or the seaside village of Cala Figuera to name but a few of the attractive sights to be discovered nearby – if you manage to leave the hotel! The hotel’s long reception area is the meeting point for the 16-guest bedrooms and the large one-bedroom apartment. The spa is small and intimate with treatment rooms for couples, double loungers in the indoor plunge pool, and a compact sauna and steam bath. The modern gym area is unusually inviting with a gorgeous view over the garden, housing the very latest in cardio and toning machines. Click on the links to find out more about the hotel’s two fine-dining restaurants: the Mediterranean Tess de Mar and Japanese Kairiku. I love the attention to detail at every turn for example the scent of the Chopard bathroom products, the carefully selected unique art piece in each room, the Lobster’s Day poolside furniture, the fish swimming on the roof of Tess del Mar, the list goes on and on…. So who will you be taking as your plus 1 for a relaxing getaway at Sa Creu Nova Art Hotel & Spa in Campos? 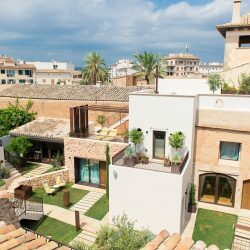 Discover more about Sa Creu Nova Art Hotel & Spa here.